We recently had our good friends over for dinner and were looking forward to opening a special bottle from the cellar. It was a 1991 Calera Mt. Harlan Chardonnay we had picked up on a visit to the Calera winery last year. Calera has an incredible and inspiring story and their wines are really quite unique for California Pinots and Chardonnays. Look closely at the picture above and you will see the large (some may say disturbing) amount of tartrates. 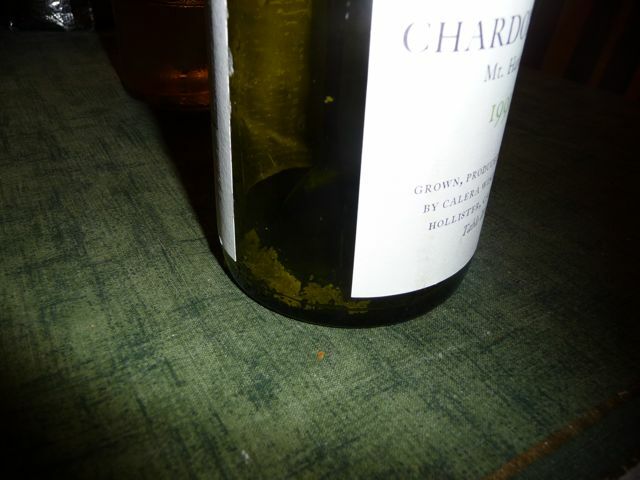 Tartrates had solidified and ended up on the bottom of this old bottle of Calera. Looks bad but it is not a fault. It was a 1991 for god’s sake. And, in fact it is a testimony to the quality of the wine and the natural winemaking methods used. Read more about tartrates here. The Calera was fantastic and was a perfect match for rich halibut we served. By the way, for those of you looking for Thanksgiving wines, an old Calera Chardonnay Mt. Harlan would make an excellent addition to your turkey dinner…so would a Pinot Noir.